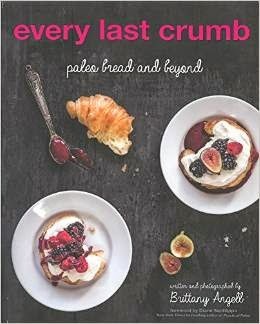 After seeing all the rave reviews of Brittany Angell's Every Last Crumb, I had to check it out for myself. This book definitely deserves all the fantastic press it's getting. Recipes range in complexity from the simple 5 minute mug cake (delicious!) to time consuming croissants (that look so, so, so very good - croissants were my favourite treat before I was forced to go gluten-free). We have tried a number of recipes (the naan, the mug cakes) and they have all turned out well. Next on the list of things to try (though they will have to wait until the weekend): the bagels, the cinnamon rolls and the croissants! Heads-up: You will need a scale to cook most recipes. Not all recipes are paleo (rice flour is used) which didn't bother me since I'm gluten-free, not paleo. Bottom line: the recipes will make you drool - don't flip through this beauty on an empty stomach! I have been woefully remiss about posting here of late! In fact its been a full year since I've posted a single thing on here. The truth? I've been busy cooking up a storm (less baking and more healthy everyday meals). I've received so many beautiful cookbooks in 2014 and been devouring the recipes peppering the pages. 2014 was a great year, though busy, full of life milestones. I left the corporate world to work on my own start-up, got married and finally got my very own spiralizer which I will be playing with in 2015. 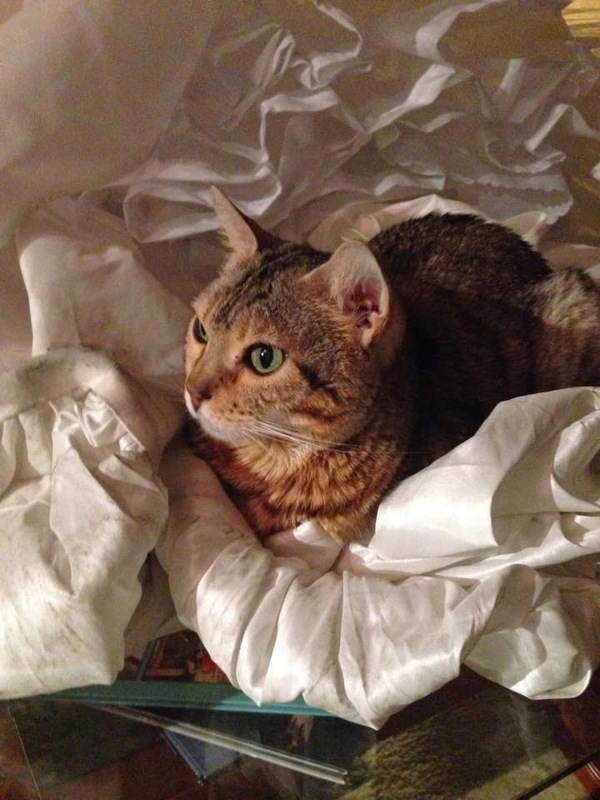 Check out my Rascal trying out the dress, post- wedding! I resolve to be better in 2015. I will share more of my "everyday", "boring" recipes and I won't wait for baking masterpieces to inspire me. What were some of my favourite cookbooks in 2014? This was hands down my favourite cookbook of 2014 (as a dedicated blog follower and recipe tester for the pecan pie recipe I even paid more to get it from fishpond when it wasn't yet available on amazon)! I think there are more recipes in this book that I have cooked than those I have not. Its hard to pick a favourite recipe from this book as I've loved and repeated almost everything I've tried. Where to start? We've tried the millet + linseed porridge with orange prunes, sweetcorn and basil fritters (made this several times and love it, great with soup and great on their own too), the carrot, cumin & red lentil soup with coriander pesto (the soup is amazing, the pesto is too - we've made both together and separately too), the buckwheat tabouli, the brown rice salad w spice roasted carrots ( really a crowd pleaser), the quinoa & lemon anzac biscuits (didn't last even an hour, they were that good), the salted caramel popcorn, the spiced pumpkin, date & quinoa muffins, the spice-roasted vegetables w/ chickpeas, millet and chermoula (great flavour combo, my guests went wild for this), the peanut brown rice patties (have done with peanuts and with cashews - both were great), the pizza (good, but not the best I've had so wont replace my go-to recipe from the Artisanal Gluten Free Cooking cookbook), the chickpea falafel wraps (so good), the red lentil dhal, the lentil spaghetti (great way to add protein to your veggie pasta), the stuffed capsicums, the chocolate avocado tart (so good and velvety, guests will love this and wont know its healthy, bonus its so easy to make - I've made this as mousse too and made it minty with the addition of mint liquor), flourless dark chocolate cardamom cake (fantastic), the pecan maple tart (too sweet for my tastes, but those that actual like pecan pie will enjoy, one of the best gf pie crusts I've tried). This is a gorgeous, well put together addition to my cookbook collection. The first ~50 pages of this book are dedicated to tools, equipment, ect, followed by some 'essential' recipes (how to cook various grain and beans, make nut & seed milks, toast nuts & seeds and roast vegetables) and pantry recipes ( simple recipes some of which would count as great meals for me, condiments and ferments). Here's where it starts to get interesting in Part 2: The Recipes. The pages that follow are peppered with interesting, inviting and overall appealing recipes. So far we have tried the creamy cauliflower and celery root soup with roasted shitakes garnish (simple in prep, but gourmet results) which everyone loved, fragrant eggplant curry with cardamom-infused basmati rice and tangy apricot chutney (good flavour mix, I reduced the amount of tomatoes by half) the tempeh portobello burgers (amazing... these were so, so, so good though a little hard to shape - I will make them again and again...), and the beet chickpea cakes (which according to the husband tasted like 'Christmas in his mouth', but were again hard to shape). By warned that portion sizes must be massive because we had a substantial amount of leftovers for most recipes (which was a great thing). This is without doubt a beautiful cookbook. Prospective buyers should be aware that Heather dedicates the first half of the book (~150 pages or so) on tools, pantry, benefits of a healthy, gluten-free plant-based lifestyle, techniques and more. Favourites so far: Heather's versatile Chickpea Flatbread (was great as a pizza crust and delicious on its own too), Black Bean Soup (simple, but satisfying) and a few more. Recipes are easy to follow, relatively quick (though one should read recipes in advance as some call for soaking/cooking of legumes or nuts) and well illustrated. Ingredients are accessible (nothing really out there). Overall a great new cookbook. I love Heather's blog and I love her book. I am steadily cooking through this book and have already made the out-the-door chia power doughnuts (the one fail so far as they were too gummy for my tastes), the on the mend spiced red lentil-kale soup, crowd-pleasing tex-mex casserole (yum though those who don't appreciate spice might want to reduce the amounts of chili powder and cayenne), the enlightened miso power bowl (an easy, healthy meal great to start the year with), the classic glo bar (easy, fast and so, so good) and the salt & vinegar roasted chickpeas (these could easily get addicting!). I have dozens more bookmarked to try (Indeed I have a date with Angela's Chakra Caesar salad and nutty herb croutons tonight). Recipes are easy, ingredients are easy to find and Angela gives prep and cooking time guidelines which I find very helpful. The layout is great (most recipes are accompanied by full colour photos, but the spine doesn't stay flat which makes it hard to read when cooking. As I have seen a lot lately in the books this year (or last I suppose), Angela has included a section on her pantry. Book is broken down by breakfast, smoothies, juice & tea, appetizers, salads, soup, entrees, sides, power snacks, desserts and homemade staples. Books I Can't Wait to Cook From! In 2015 I am eagerly awaiting the Sprouted Kitchen's second cookbook: The Sprouted Kitchen Bowl and Spoon, My New Root's debut cookbook and the Urban Poser's My Paleo Patisserie. I am also excited for follow-up cookbooks from the Art of Gluten Free Baking (I was a recipe tester and I KNOW how excited you should all be to get this!!!) and La Tartine Gourmande. Ever since I returned from my three week long winter holidays overseas, I have been craving fresh vegetables like crazy. On vacation (like most people), I ate a ton more starch than normal with a diet heavy on delicious gluten-free perogies and potato dumplings, but quite low on green vegetables. As a result, my body is now crying out for a reset and a return to lush veggies and simple, but satisfying meals. Its been hard to fit in experimentation in the first week back to work (I tend to subsist more on hearty salads than anything else) so I had to wait until the weekend to make these. I have to say that they are worth the wait. These wraps are filled with flavours: sweet cranberries and roasted squash, toasty sunflower seeds, and sultry sundried tomatoes all in one pretty package. I was planning on using collard greens in place of wraps but had surprise company last minute and decided on serving something more substantial instead. I tried these (to the right) coconut wraps for the first time and they were pretty awesome (they did not toast well however - so if you go this route forgo toasting your wrap)! Blend all ingredients in a mini food processor until smooth. Cook quinoa according to package directions, replacing 1/2 a cup of required water with coconut milk (I usually use a 2:1 ratio of liquid to quinoa and cook covered for an initial 15-20 minutes before turning off heat and letting stand covered for an additional 15 minutes). Toss butternut squash in 1 tsp of olive oil and a pinch of salt. Spread evenly on a baking tray and bake an initial 15 minutes. Meanwhile, massage shredded kale with 1/2 tsp olive oil and 1/4 tsp salt. Remove squash from oven and turn cubes over so they bake on both sides. Add kale to baking tray and bake for an additional 8 minutes. In between starting a new job and life in general there hasn't been a whole lot of time for blogging. There has indeed been experimentation in the kitchen, some holiday baking and delicious recipes all around, but I admit that I haven't found the time to snap the right shots or take proper notes to share with you. On vacation now in Poland and things have slowed down considerably. It is a lot harder to find the flours I'm used to and so I have had to do a ton more experimentation. Today I made a tasty banana loaf filled with pistachio nuts and chunks of chocolate. I admit that I have been cheating and added eggs back in to my diet while here in Poland. So far, I haven't experienced any ill effects, but I will try this with a flax seed egg when back in Canada and see how it holds together. I didn't have measuring cups available to me so these measurements are eyeballed, but the results were so good I had to share right away. I will try to test this again and update with any changes when I am back in Canada. Protein Packed Peanut Butter Squares! Since learning I can no longer eat almonds, I have been forced to give up my favourite protein bars of all time - the Elevate Me Bar. I used to take these bars tucked in my purse whenever I left the house. Vacations in places where Gluten Free options are less available usually meant I took a case or two whenever I traveled. Unfortunately, I've since discovered that most protein bar options are either gluten-free or almond-free but not both (or they just taste awful ha). One exception has been the Quest Chocolate Peanut Butter Protein bar, which upon me finding it, promptly disappeared from stores nearby. To top it all off, this week I ran out of my Vega protein powder and was unable to restock as it seems there has been a recall on the product. This all must be a sign for me to stop procrastinating and begin developing my very own protein bars. The day I share protein bars with you will not be today however. Sadly, after making these (my first attempt), I discovered that the protein content was probably too low to qualify as a protein bar. They do however make a delicious protein packed square. The picture is not that great, but they are awesome so I urge you to try them! Today was a day for experimentation! I have been playing around with substitutes for pasta (my comfort food) for a while now, but had yet to tackle lasagna. 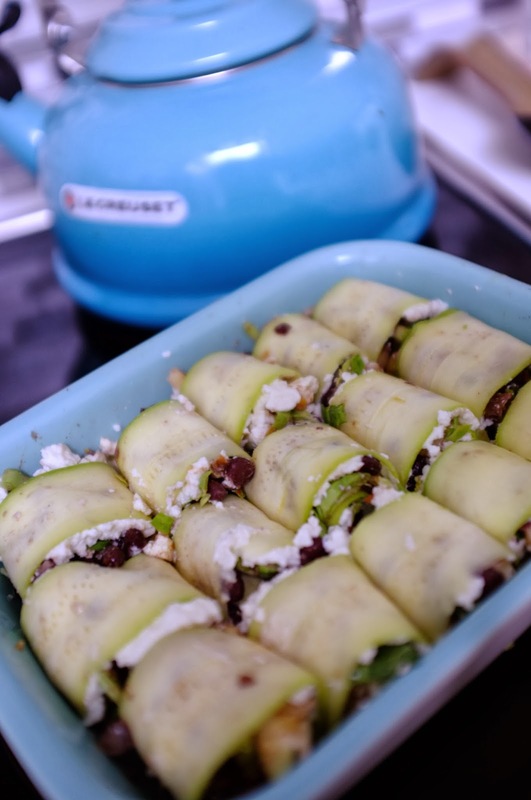 I initially intended to make a zucchini noodle lasagna, but decided to use up some of the ingredients in my fridge and ended up with these gorgeous little black-bean roll-ups instead. These rolls use zucchini in place of noodles for what I feel is a pretty light meal. I filled mine with black beans, apples, apricots, a pepper and brussel sprouts for a good mix of sweet, hot and salty flavours. Because dinner was so light, and also because I found a bag of Spy apples (my fave for baking) at the grocery store across the street, I decided to make an Apple Pie for dessert. Hahaha - don't laugh! I almost published this without typing up my recipes. Was sitting here wondering why the post was looking so short and then something clicked. It might help to actually add my recipes! I've been entirely uninspired in the kitchen lately. I've been struggling to make some decisions about what to do next with my life and have sadly been doing very little cooking experimentation as a result. I've also been trying to cut back on my baked goods, I admit, possibly the bigger factor here! This weekend, I decided I wanted some cookies and set out to make something interesting and new. I started throwing ingredients I liked into a bowl haphazardly and ended up with these cakes instead. They are nowhere close to cookies, but they hit my craving for something sweet and the Monk requests that I make them again soon. 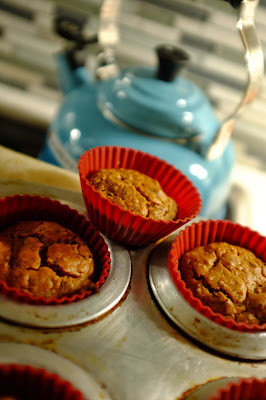 Monk’s Paw is a blog about living gluten-free, egg-free and mostly refined sugar free.